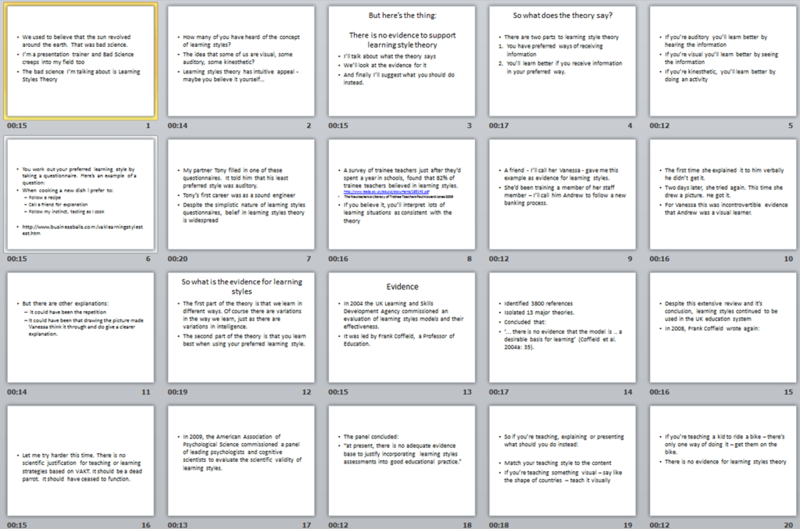 I set myself the challenge of preparing my first Ignite presentation as fast as possible. The Ignite presentation format is a 5 minutes long presentation with 20 slides and with the slides advancing automatically every 15 seconds. It’s the presentation equivalent of a haiku or sonnet. It’s a very challenging format which can take forever to prepare. 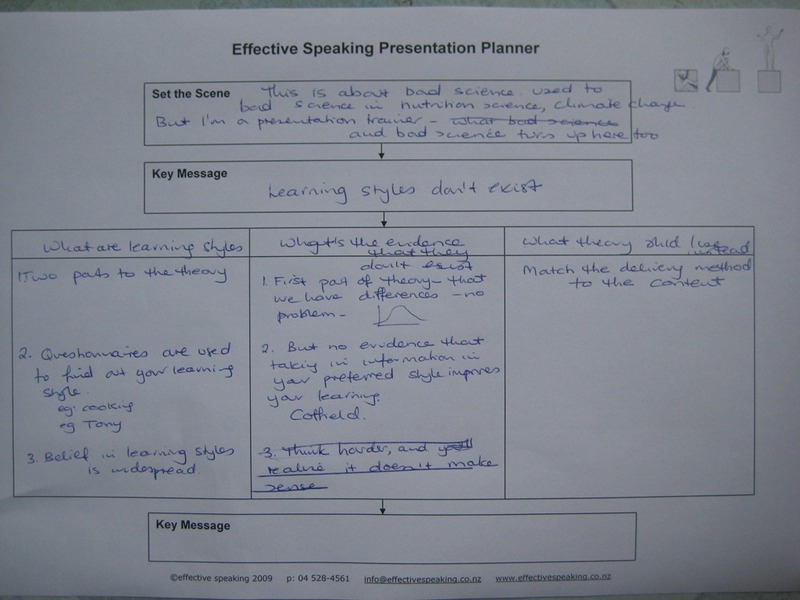 I used my normal presentation planner which I teach to all my clients. Here’s a picture of my planner – as you can see neatness was not important. I just wanted to get my key message and sequence of ideas down on paper. The Slide Sorter view (above) showed me how long I spent talking on each slide. My aim was for each slide to take 13 to 15 seconds. The reason for this is that I think it’s better to have to wait a beat for a slide, than to be running out of time and constantly playing catch up. When I first tried this out I was all over the place, some slides taking 7 seconds and some 34 seconds. I spent time rearranging, deleting and massaging. In the screen shot above you can see that I had got most of the slides close to 15 seconds, but I still had some work to do to shorten some. 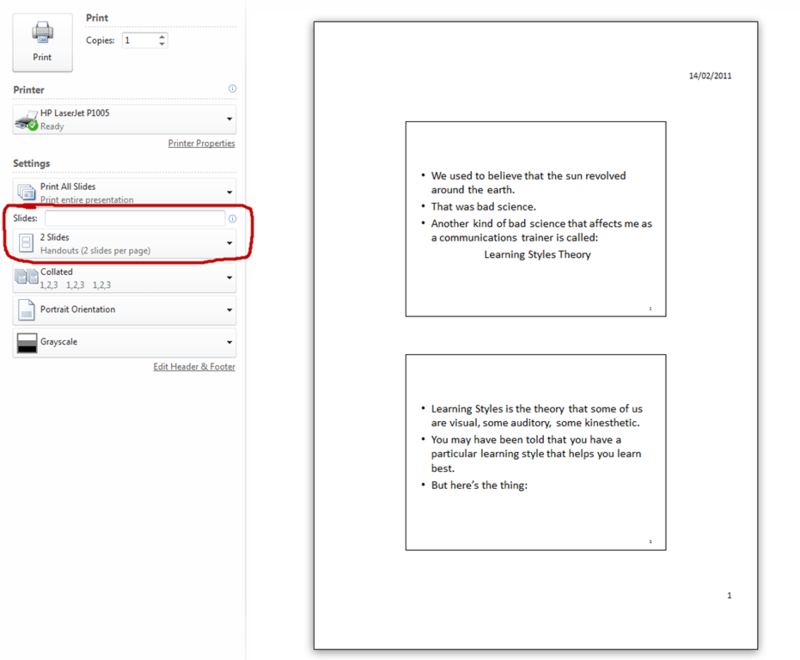 Ignite is one type of presentation format when preparing a script is virtually essential during the preparation phase. Working from a script allows you to massage your sentences to fit the 15 second time blocks. A slight change in sentence structure can make a significant change in the time it takes to say something. So this is one occasion where you should plan to say it the same way every time (not normally something I recommend). 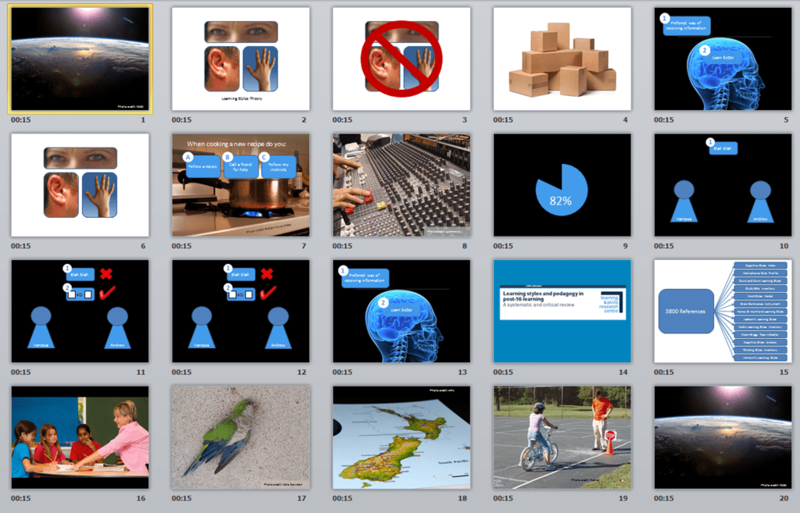 I set my visual slides to advance automatically at 15 seconds and started rehearsing. 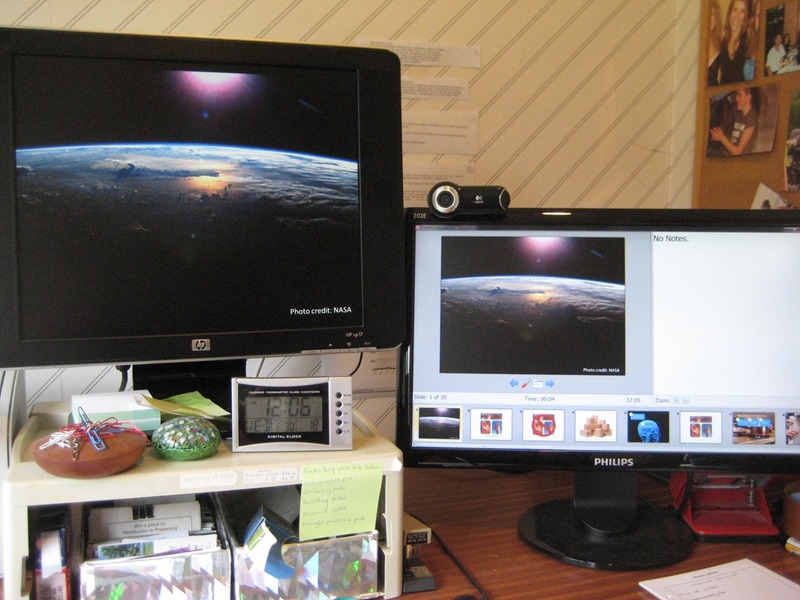 Using my two-screen set-up and Presenter View I was able to see how long I had to go before the slide changed. My major frustration at this stage was that I couldn’t find a way in PowerPoint to record my narration at the same time as having my slides automatically advance every 15 seconds. This meant that I couldn’t playback my slides and audio to check my timing. If you know how to do this I would love you to add a comment. This step took the longest as I fine-tuned my pace to get my timing just right. For example, I wanted my dead parrot slide to appear just as I said “dead parrot”! I used notes for the actual presentation as well. I could have spent extra time memorizing it, but I didn’t see a sufficient pay-off for that extra time. I had rehearsed enough that I did spend most of the time connecting with the audience. Fantastic post. This is useful not only for creating an Ignite presentation, but any presentation. Few people dissect the process of creation, especially the work BEFORE you even open your computer and AFTER you’ve finished designing. Bravo. Brilliant – I can’t believe that I haven’t read something like this before. Thanks, Olivia! Really great stuff, Olivia! Congratulations. I tell the people in my courses that an excellent presentation is like an iceberg: What we see (the presentation) is very small compared to what lies beneath the surface (the preparation). Your post demonstrates, succinctly and eloquently, that what comes out is in direct proportion to what goes in. Jon, Craig and John, Thank you for the lovely comments. A tweeter pointed out that I still spent 8 hours preparing for a 5 minute presentation. It’s a long time. But from other people I know who’ve done Ignite presentations and from blog posts I’ve read it can take a heck of a lot longer. 1. You’ll need to put more work (read: time) into developing the overall structure of the presentation and crafting engaging content. 2. You won’t need to spend anytime on dividing your presentation into discrete 15 second blocks! Olivia, this is brilliant – thanks for sharing. It’s good to let Ignite presenters know up-front they need to spend some serious time preparing, and your method is very sensible. The 5 minute presentation which took 8 hours of preparation could easily be re-used as a longer presentation, now that all the hard work has been done. Thanks Stephen. That’s very true that having prepared a 5 minute presentation you can easily scale it to a longer timeframe. The discipline of creating the 5 minute presentation first is likely to lead to a better 50 minute presentation too! Love the post, esp the audio Slidecast. It’s mind opening to hear alternative perspective about the learning style theory. I have a question though about the concept behind Ignite Presentation: why on earth do we need to spend so much time to rehearse so that the slides will correlate with what we say? Why not just use a clicker and click when it’s time to show the next slide? There’s no good reason for doing it in a “normal” presentation, but it’s a major part of the fun of Ignite. The idea is to make presentations enjoyable again, as an antidote to all the boring, death-by-powerpoint sessions we’re used to. Making the slides auto-advance adds an extra challenge and an element of danger to the presentations – once they start, there’s no going back. I agree with what Stephen has said. I don’t regard an Ignite presentation as a regular presentation, but rather as an art form. The constraints of the form lead to more creativity. In particular, the constraints of the form make it almost impossible to produce a series of boring bullet-points slides. And it’s really fun for the audience! I’m asking my students to try Ignite! talks this semester. It’s the first time I’ve done them, as a bit of an experiment, so we’ll see how it goes. It’s not the only talk they’re giving, though, so the Ignite! talks are “low stakes,” as it were. And for what it’s worth, I gave my students this link, and have already heard that they found it very helpful! So well done, you! I’ve learned quite a bit and admire the effort you put into this production and appreciate you sharing it. great tipz, Olivia. thankz a lot. Keep the mood, ok? Z. While I wholeheartedly disagree with your Ignite speech thesis about learning styles, I appreciate this post on how to prepare an Ignite speech. I have assigned my students the task of creating their own Ignite speech (it requires demonstration of all of the things we’ve been practicing since the start of the semester) and referred them to this post. Great job! Here’s an infographic that I put together for the folks I coach on the Ignite style. Maybe helpful to your readers as well? Thank you so much for this manual! I have to give an Ignite presentation on a research project I’ve done and I had no idea how to start this. It helped me out a lot! These are really great ideas in about blogging. You have touched some fastidious factors here. Pretty cool idea, it’s always better to do it in a team of people of course whenever you got the chance to work with others. Brainstorming ideas and then making the presentation itself is way faster that way.